Want to know what bug is making holes in the leaves of you shrub or eating your fruit? Or what is the pesky weed you cannot get rid off? 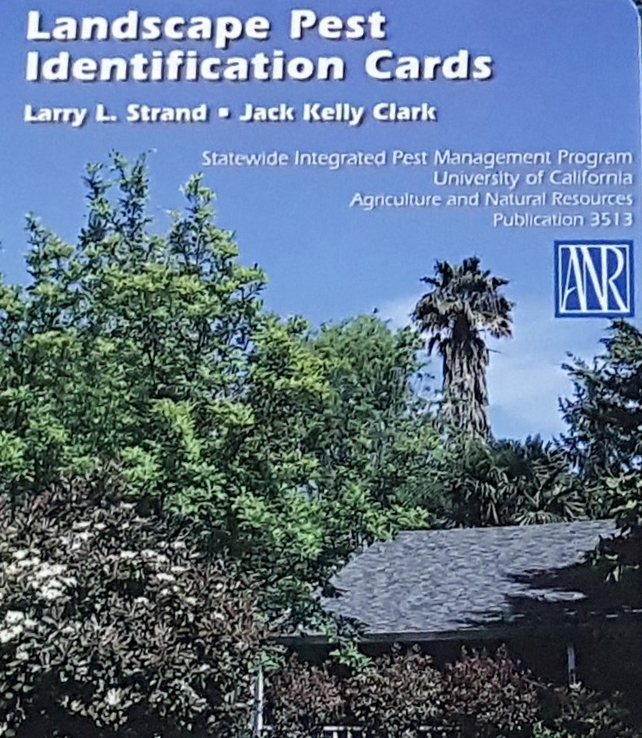 The University of California Division of Agriculture and Natural Resources publications have four sets of Pest Identification cards for you. These pocket-size, sturdy, laminated cards can be easily carried with you as a quick reference wherever you need them. The sets are also available as electronic publications formatted for iOS and Kindle compatible devices. The Vineyard Pest Identification and Monitoring Card Set is the perfect quick reference to stay on top of pest activity in your vineyard. The 50 cards covers 41 common insect pests and mites, 11 diseases, 23 beneficial insects, weeds, and vertebrate pests. Each pest is identified by a description and excellent close-up color photographs with 244 photos in all. On the reverse of each card is a description of the various life stages and monitoring tips. 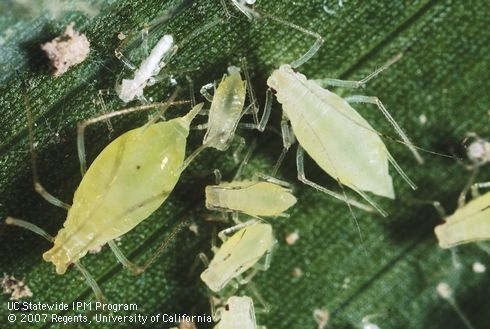 The cards include everything from mealybugs and phylloxera to leafhoppers and Eutypa dieback, all of which have an impact on California vineyards. It also includes descriptions of natural enemies as well as handy inch and metric measurement scales. These cards are also available as a separate card set, publication #3538, in Spanish. You can purchase each card set alone or in bundles for a price break. The bundles are perfect for vineyard managers and their crews. The Tree Fruit Pest Identification Card Set is available only as an electronic publication. The set covers major insect and mite pests and several important diseases in California deciduous tree fruits and nuts. Each pest is identified by a description and close-up photographs of important life stages to help you know how and when to look for these pests -- in both growing and dormant seasons. The cards also include descriptions of natural enemies. The Landscape Pest Identification Card Set will help landscape maintenance professionals and home gardeners identify and manage most major common pest problems in the landscape. The 43 cards cover 80 common insect pests and mites and 40 diseases of flowers, shrubs and trees. It also covers other disorders and invertebrate pests. Each pest is identified by a description and excellent close-up color photographs of important symptoms and life stages with 211 photos in all. The cards include everything from aphids and whiteflies to glassy-winged sharpshooter and sudden oak death, all of which have an impact on California landscapes. It includes descriptions of 20 beneficial insects and suggestions for least-toxic management options. The Weed Identification and Monitoring Card Set is based on the bestselling Weeds of California and Other Western States; this is the perfect pocket-sized companion for anyone working in the field. 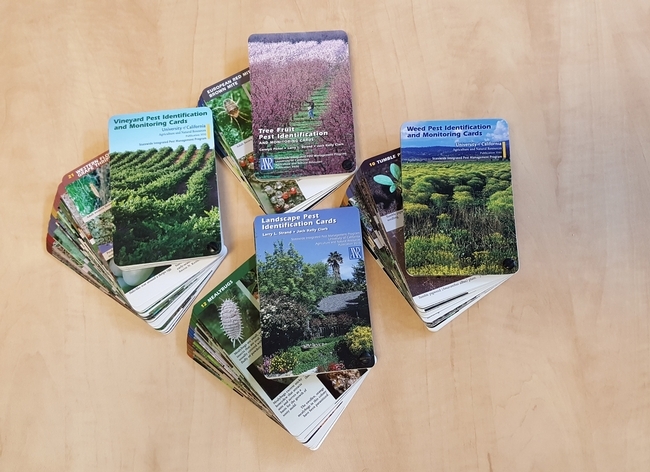 These 48 cards cover the most common weeds, grouped into 8 categories for easy identification: 1) broadleaf annuals, erect; 2) broadleaf annuals, low growing; 3) broadleaf annual, scrambling; 4) broadleaf perennials, not viney; 5) broadleaf perennials, viney; 6) grass annuals; 7) grass perennials; and 8) sedges. From pigweed to chickweed, dandelion to bermudagrass, goosegrass to ryegrass, these cards have you covered. Each weed is identified by a description and excellent close-up color photographs of various growth stages with 187 photos in all. On the reverse of each card is a description of growth stages, habitat, distribution and management tips. It also includes handy inch and metric measurement scales. A sturdy rivet keeps the set together so individual cards don't go astray. A new set Pests of the Garden and Small Farm Card Set is coming out soon. Stay tuned for its release. Currently, there is a beautiful book, publication 3332. Backyard gardeners, if you still cannot identify that weed, bug or problem with your plant, you can always bring a sample to our Master Gardeners desk. There is a drop box available to leave samples after hours. Potato aphid adults and nymphs. Photo Jack Kelly Clark, UC IPM. Need to identify a weed or pest in your garden, orchard or vineyard? The Landscape Pest Identification Card set will help landscape maintenance professionals and home gardeners identify and manage most major common pest problems in the landscape. The 43 cards cover 80 common insect pests and mites and 40 diseases of flowers, shrubs and trees. It also covers other disorders and invertebrate pests. Each pest is identified by a description and excellent close-up color photographs of important symptoms and life stages with 211 photos in all. The cards include everything from aphids and whiteflies to glassy-winged sharpshooter and sudden oak death, all of which have an impact on California landscapes. It includes descriptions of 20 beneficial insects and suggestions for least-toxic management options. The Vineyard Pest Identification and Monitoring Card set is the perfect quick reference to stay on top of pest activity in your vineyard. The 50 cards covers 41 common insect pests and mites, 11 diseases, 23 beneficial insects, weeds, and invertebrate pests. Each pest is identified by a description and excellent close-up color photographs with 244 photos in all. On the reverse of each card is a description of the various life stages and monitoring tips. 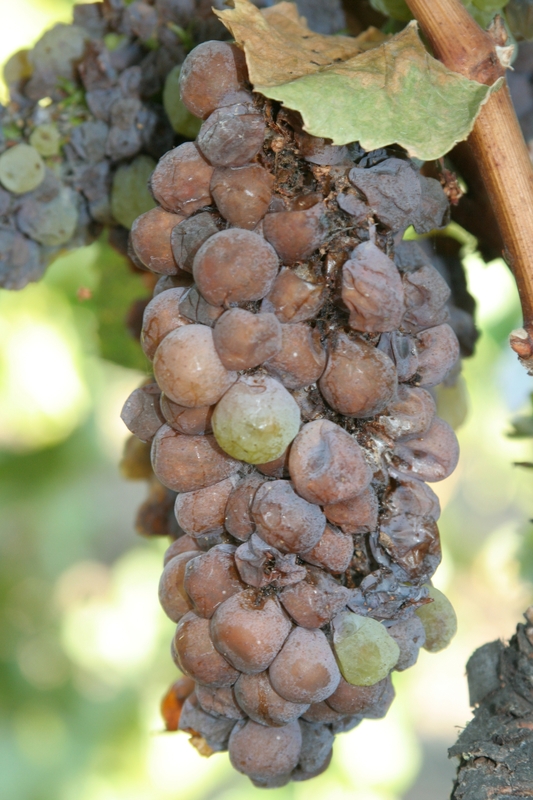 The cards include everything from mealybugs and phylloxera to leafhoppers and Eutypa dieback, all of which have an impact on California vineyards. It also includes descriptions of natural enemies as well as handy inch and metric measurement scales. These cards are also available as a separate card set, publication #3538, in Spanish. You can purchase each card set alone or in bundles for a price break. The bundles are perfect for vineyard managers and crews. The Weed Identification and Monitoring Card set is based on the bestselling Weeds of California and Other Western States; this is the perfect pocket-sized companion for anyone working in the field. These 48 cards cover the most common weeds, grouped into 8 categories for easy identification: 1) broadleaf annuals, erect; 2) broadleaf annuals, low growing; 3) broadleaf annual, scrambling; 4) broadleaf perennials, not viney; 5) broadleaf perennials, viney; 6) grass annuals; 7) grass perennials; and 8) sedges. From pigweed to chickweed, dandelion to bermudagrass, goosegrass to ryegrass, these cards have you covered. 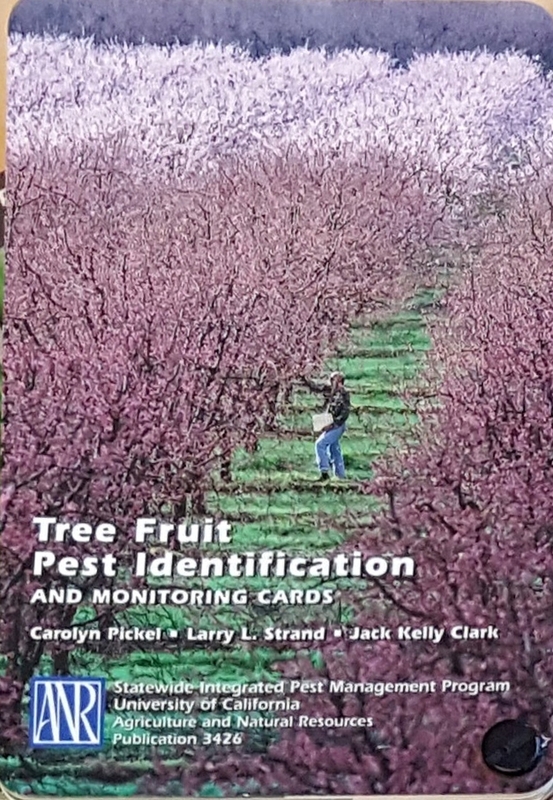 The Tree Fruit Pest Identification Card set is available only as an electronic publication. The set covers major insect and mite pests and several important diseases in California deciduous tree fruits and nuts. Each pest is identified by a description and close-up photographs of important life stages to help you know how and when to look for these pests -- in both growing and dormant seasons. The cards also include descriptions of natural enemies and suggestions for least toxic management options. A new set Pests of the Garden and Small Farm Cards is coming out soon. Stay tuned for its release. 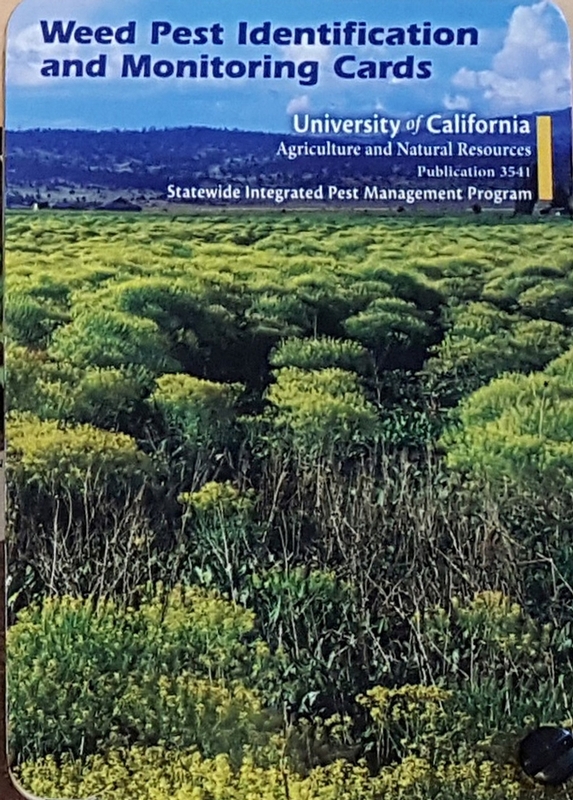 To purchase the card sets or electronic versions, visit the University of California Division of Agriculture and Natural Resources publication catalog. Refer to the table below for the publication number. Or click on the publication number below and the link will take you to that page in the catalog. Backyard gardeners, if you still cannot identify that weed, bug or problem with your plant, you can always bring a sample to our office. There is a drop box available to leave samples after hours. 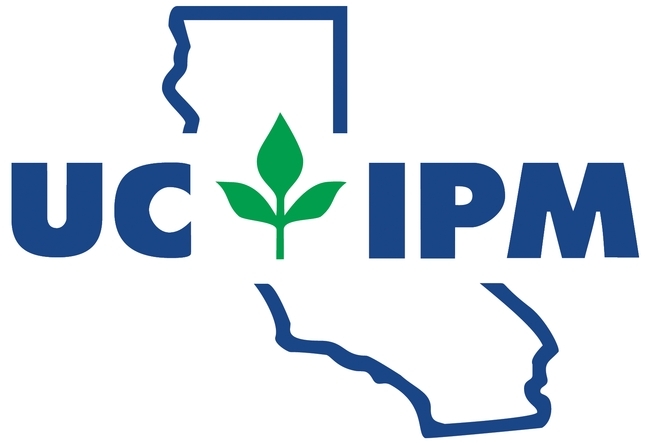 Three of the twelve awards announced for the upcoming International IPM Symposium will be given to UC Integrated Pest Management Program members including Lucia Varela and Rhonda Smith from UCCE Sonoma. 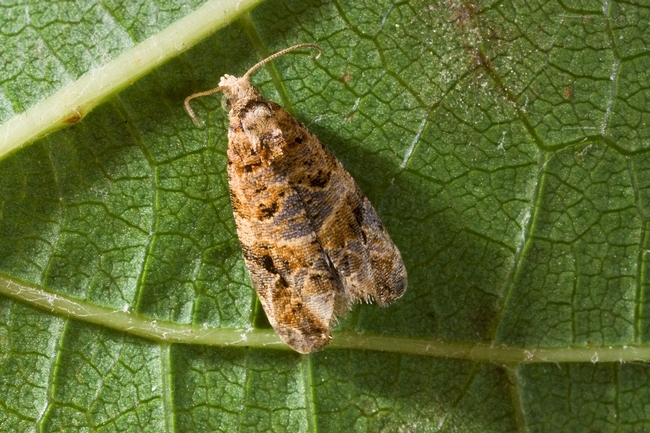 The European Grapevine Moth Team was selected for an IPM Team Award for achieving the eradication of European grapevine moth only six years after its discovery in 2009. Team members helped growers in infested counties to monitor the pest and apply control measures on a timely basis. The team's research and extension efforts helped growers avoid losses to the pest every year until it was finally eradicated in 2016. The European Grapevine Moth Team includes Lucia Varela, UC IPM advisor for the North Coast; Monica Cooper, UC Cooperative Extension viticulture advisor in Napa County; Walter Bentley, UC IPM entomologist emeritus; Larry Bettiga, UC Cooperative Extension advisor in Monterey County; Kent Daane, UC Cooperative Extension specialist in UC Berkeley Department of Environmental Science, Policy and Management; Rhonda Smith, UC Cooperative Extension advisor in Sonoma County; Robert Van Steenwyk, UC Cooperative Extension specialist in UC Berkeley ESPM; Joyce Strand, UC IPM academic coordinator emeritus; and Zalom. The winners will receive their awards and recognition at the 9th International IPM Symposium March 19-22, 2018, in Baltimore, Md. Example of damage by EGVM. Is your pesticide safety training in compliance with the new Worker Protection Standard? We are in the midst of a new and changing era of Worker Protection Standards (WPS). The U.S.
Environmental Protection Agency (EPA) and the California Department of Pesticide Regulation (DPR) recently published the revised WPS, which is meant to increase protections for agricultural fieldworkers and pesticide handlers from pesticide exposure when they're working in farms, forests, nurseries and greenhouses. The changes are already affecting California agriculture! What major regulatory changes have already gone into effect? 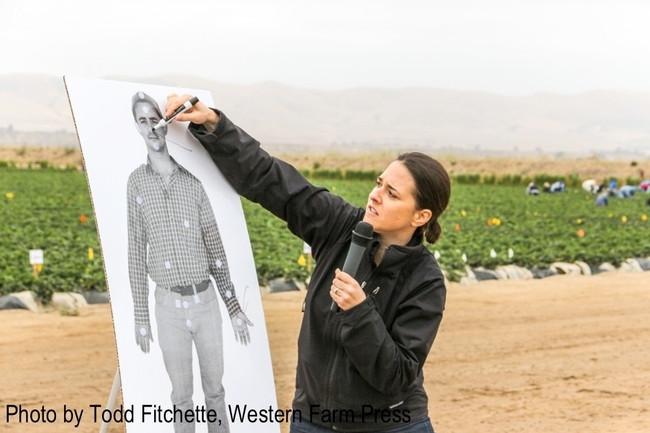 All 417,000 fieldworkers in California must attend annual pesticide safety training. Records of all fieldworker pesticide safety trainings must be kept on file for 2 years. Fields must be posted when the restricted entry interval (REI) exceeds 48 hours. “Application-exclusion zones” must be implemented to prevent the entry of anyone into areas up to 100 feet from pesticide application equipment. Instructors previously qualified via a DPR-approved Instructor Training programs (Train the Trainer) are qualified to train through 2017. If you wish to be qualified to train fieldworkers and handlers after December 31, 2017 using this qualification, you must complete an updated, DPR-approved Train the Trainer workshop. Now is the time to make sure these changes are put in place! What major regulatory changes are still in store for us? When will they happen? Who do these changes affect? Additional training topics for fieldworkers and handlers have to be added to the curriculum. Handlers have to suspend an application if anyone enters the application exclusion zone. Many people who work in the California agricultural community will be impacted by the WPS revisions. These include fieldworkers, pesticide handlers, farm labor contractors, private and in-house safety trainers, growers, farm managers, licensed pesticide applicators (private and commercial), pest control advisors (PCAs), and crop consultants, to name a few. How do I know if I am qualified to train? If you attended one of the DPR-approved Train-the-Trainer programs you are qualified through 2017. However, if you wish to continue training after the end of the year, you must complete a DPR-approved Instructor Training Program, which includes the 2018 training topic requirements. If you maintain certain licenses/government designations, including PAC, QAC, QAL, PCA, and certain County Biologist licenses you are qualified to train. UCCE Advisors are also qualified to train. How can I get qualified as a trainer? To become a trainer, take an Instructor Training program that is approved by DPR for 2018 topics. 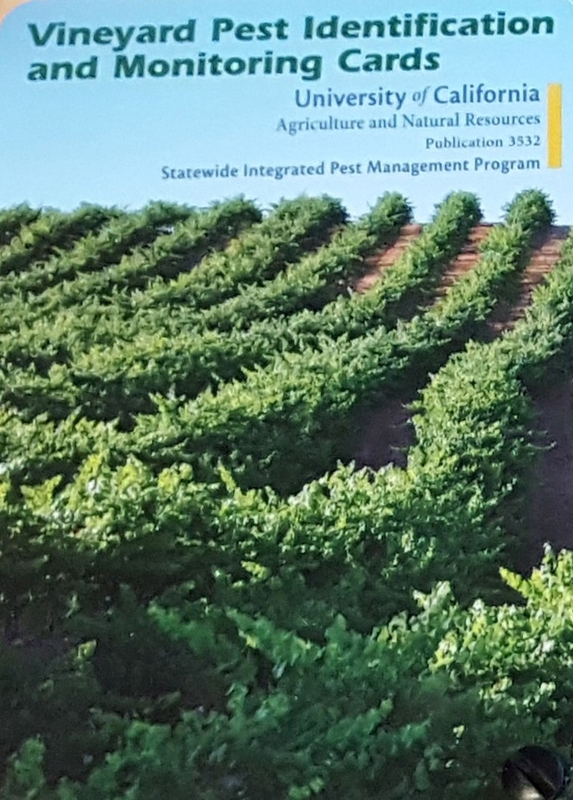 The University of California Pesticide Safety Education Program (part of the UC Statewide Integrated Pest Management Program, UC IPM), in partnership with AgSafe, will offer multiple workshops this spring that cover the new federal requirements for fieldworker and handler training. You can reserve your spot now. At the end of the training you will be a Certified Pesticide Safety Instructor. If I am currently qualified, how can I make sure I stay up to date on all the new requirements? If you are currently qualified as a trainer because you maintain a California PAC, QAC, or QAL, or if you are a PCA, you can attend an Instructor Training Program this spring to learn about the new WPS requirements and additional training topics. While a certification may qualify you, an Instructor Training Program will prepare you to train! Register today! 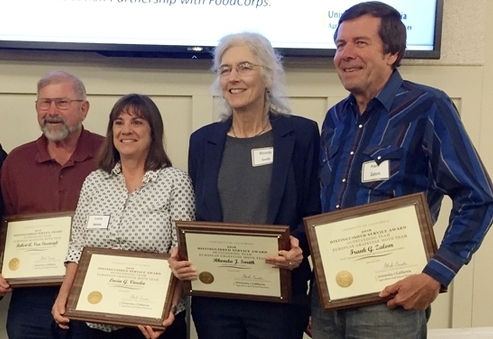 UCCE Sonoma County congratulates Lucia Varela, Ph.D., Area-wide Integrated Pest Management Advisor for the North Coast on being awarded Friend of Sonoma County Agriculture by the 20130 Sonoma County Harvest Fair. Each year, the Sonoma County Harvest Fair recognizes five individuals or businesses for their dedication and support to Sonoma County’s 3 Billion dollar agriculture industry. 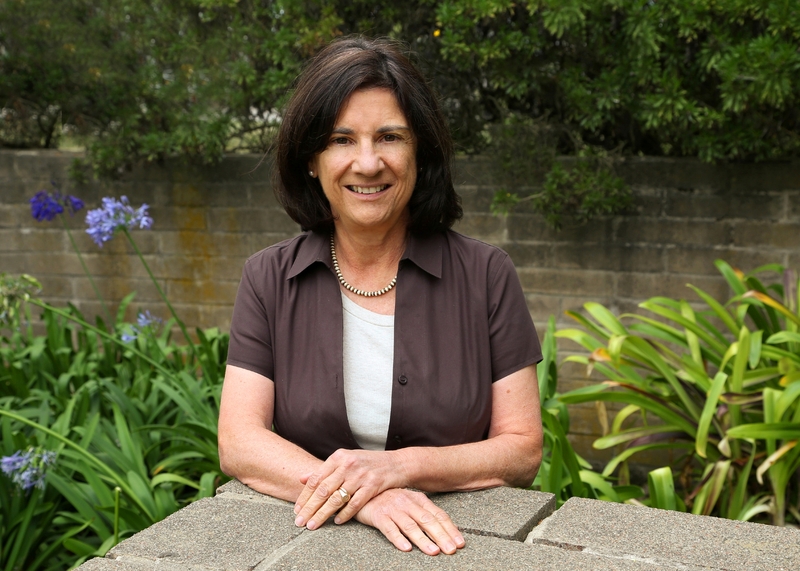 This year’s Friend of Sonoma County Agriculture is being awarded to Lucia Varela, Ph.D. The award recognizes an individual who works to promote and enhance the agricultural industry through their contribution, operation and community involvement in Sonoma County. This award is given to someone who is not directly involved in agriculture, but has supported and benefitted the industry through their endeavors. Congratulations Lucia in recognition for your years of support of Sonoma County Agriculture.